At a time when the shooting death of an unarmed black teenager in Ferguson, Mo., has brought tensions between police and minority communities to the forefront, Rocky Mountain PBS News has found that racial disparities persist in police shootings in Denver. 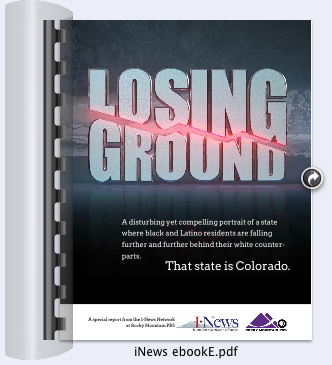 Download the entire Losing Ground project in this e-book (PDF) Seven of the 33 people shot by Denver police and sheriff’s deputies in the past five years were African American, according to data collected by the Office of the Independent Monitor, a city watchdog. That’s about 21 percent, compared with an overall black population in Denver of 9.7 percent during roughly the same period, according to Census data. Thirteen of those shot between 2009 and 2013 were Latino, and 12 were white. That means about 39 percent of the shootings involved Latinos, who comprise 32 percent of the population, while 36 percent involved whites, who account for 52 percent of the population. Matthew Murray, chief of staff for the Denver police, said the numbers don’t tell a full picture, and inferring meaning from them would be “dangerous” without more research. But Denise Maes, public policy director for the Colorado chapter of the American Civil Liberties Union, said the data points to lingering inequality in the treatment of minorities across the criminal justice system. “While we like to think of ourselves as living in the post-racial world, these numbers clearly bear out something completely different,” said Maes. In the lead up to the long-awaited grand jury decision in the Ferguson case, black and Latino Coloradans told Colorado State of Mind about their own experiences with police and what they now tell their children. Nationwide, research on the use of force by law enforcement has consistently found significant racial disparities. New York-based investigative news organization ProPublica recently reported, based on FBI data, that young black males were 21 times more likely to be shot dead by police than young white males. 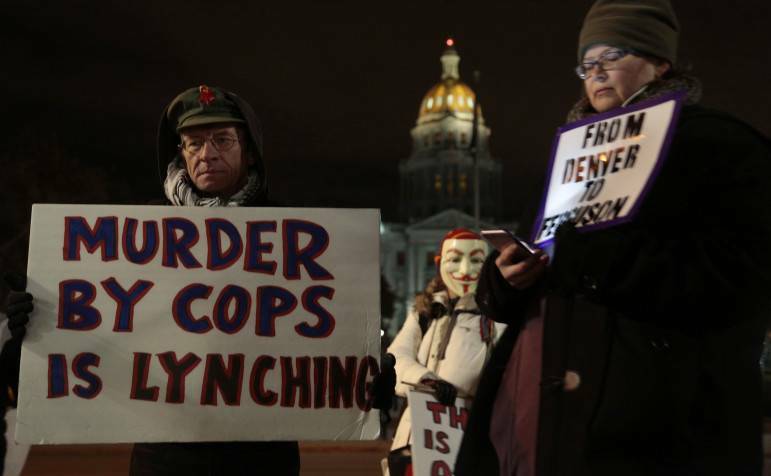 Denver hasn’t been immune to charges of racial profiling. It has been more than 11 years since the shooting death in his home of Paul Childs, a developmentally disabled 15-year-old, galvanized anger in the African-American community in Denver about excessive force by police. The July 2003 death led to changes in the training of Denver police officers to improve their sensitivity in responding to crises. The city paid the Childs family a settlement of $1.3 million in the case. 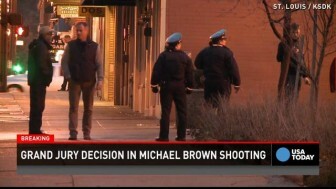 RMPBS News partner 9News’ coverage of the Michael Brown shooting case and reaction. Since then, a steady stream of injuries and deaths of minorities at the hands of law enforcement have kept alive the perception in some communities of racial bias in the police force: The July 2004 death of 64-year-old Latino man Frank Lobato, who was unarmed and in his bed when he was shot; the 2009 beating of 19-year-old African-American college student Alex Landau, who was pulled over for failing to signal; and the 2010 death of Marvin Booker, a homeless African-American preacher who was shocked with a Taser and put into a sleeper hold by deputies at the Denver jail. In October, the Booker family was awarded $4.7 million by a federal jury. Nicholas Mitchell, the city’s independent monitor, notes that the Denver police, unlike New York, Chicago and other departments, don’t collect data about officers’ contacts with members of the community by race, location and other variables. “If Denver were to collect this data, it would help us to more systematically evaluate the role of race in police interactions, and address community concerns about minority overrepresentation,” Mitchell said. The August shooting of 18-year-old Michael Brown in the St. Louis suburb of Ferguson by white officer Darren Wilson exposed raw nerves and triggered weeks of protests. In a much delayed but dramatic announcement Monday night, St. Louis County Prosecutor Robert P. McCulloch announced that a county grand jury would not indict Wilson on any criminal charges. Michael Brown’s family released a statement expressing their profound disappointment. Some of the issues at play in Ferguson, which is majority black but where the leadership is primarily white, don’t have a parallel in Denver, with its African-American mayor, police chief and sheriff. A study published in 2007 and co-authored by Tracie Keesee, then a commander in the Denver police department, examined police officers’ reactions to a video simulation of confrontations with armed and unarmed people, black and white. The study found that Denver police shot at unarmed targets at roughly equal rates regardless of race, in contrast to members of the general community who demonstrated a racial bias when using the same video simulation. The study was interpreted as an indication that officers could be trained to be less trigger-prone. Denver police officers routinely undergo sensitivity training, said Murray. He added that the department has also recently ramped up its crisis intervention training for responding to mental health crises. The Office of the Independent Monitor has noted the high rate of shootings in 2013 that seemed to involve people in the middle of a mental health crisis. Nonetheless, Rev. Leon Kelly, a Denver anti-gang activist, said the city’s leadership has a responsibility to address the perception in the community, whether or not it is justified, that police “shoot first and ask questions later” when it comes to black residents. “If the perceptions don’t change, a lot of times the outcomes don’t change,” said Kelly. He said he hoped that the current African-American leadership in Denver could provide a stepping stone to break down barriers, create a more diverse police force and improve perceptions. For now, he said, the discrepancies in the shooting numbers aren’t surprising.